The living room in Christina Karras's 1920s bungalow features a velvet-upholstered tufted sofa and vintage Milo Baughman chairs recovered from the designer's parents' home. 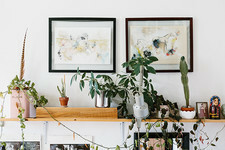 Idecompress the second I open the little gate,” says designer Christina Karras of her Spanish-style bungalow, a charming retreat nestled in a gently sloping hillside in Santa Monica, California. 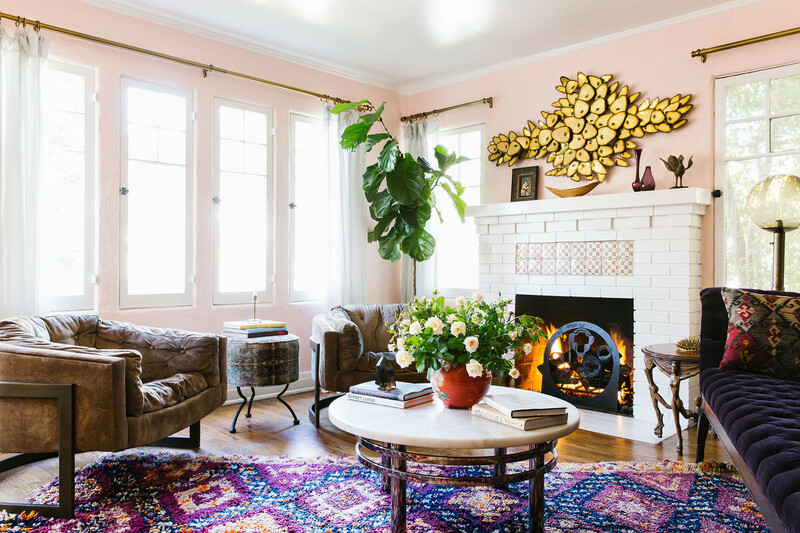 One of many 1920s stucco abodes originally built to provide rest and relaxation for silver-screen stars, the home—with its pink exterior and lush arbor of sweetly fragrant roses—is a candy-colored dream that betrays the high drama found within. “It’s enchanting to come home to,” Karras says, hinting at the tranquility the house continues to instill. The designer relaxes in her outdoor living room, with the family's red-nosed pitbull, Mocha, and Foxy, a long-haired Chihuahua. 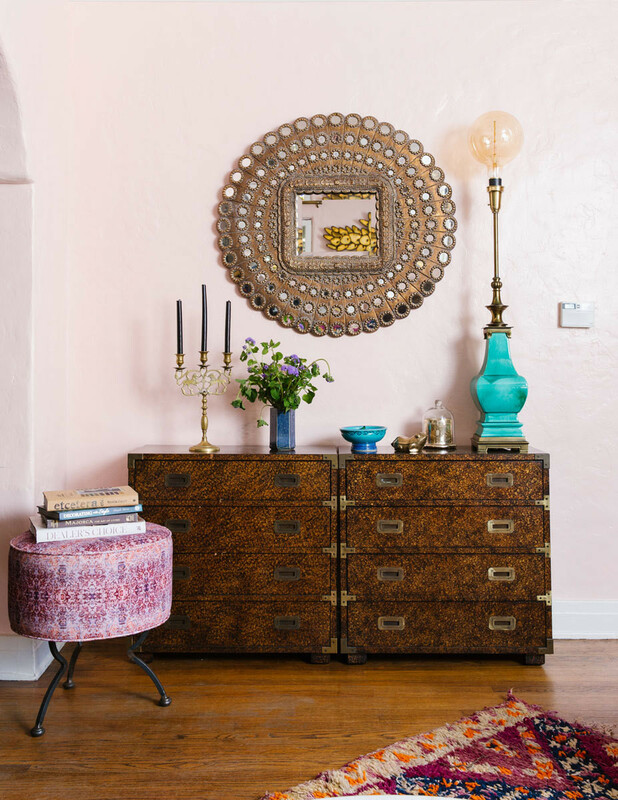 Colorful accents coordinate with an ornate mirror and angular campaign chests in the living room. It’s a fitting escape from the excitement of her busy work life. During the day, Karras collaborates on interiors and custom furniture from her showroom on La Brea Avenue. “I do a lot of rock-and-roll interiors,” she says of her musician clientele, “with an edgy twist on classic and a mix of Old Hollywood glamour.” The same is true of her own home, where she has a “very ‘70s Stevie Nicks vibe going on” and has incorporated many of her showroom staples, including patterned button stools that double as accent tables and a decadent tufted-velvet sofa. Seeking to incorporate worldly perspectives in addition to her own, she has also layered the types of eclectic vintage pieces she’s been drawn to for most of her life. “I’ve been collecting [furniture with my parents] since I was a kid,” she says of the living room's Milo Baughman chairs and campaign-style chests. The combination feels like a bohemian hideaway—one with a carefully edited point of view. On her coffee table, Karras proudly displays the brand-new book How We Live by friend and photographer Marcia Prentice. A 1960s outdoor table is surrounded by reupholstered peacock chairs in the dining area. A vintage crystal pendant hangs above a rustic farm table in the kitchen. 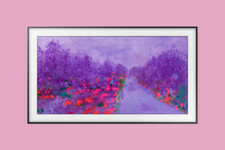 Colorful fruit is highlighted with equally vibrant tabletop pieces. A sweet staircase is elevated with delicate pendant lighting and family paintings. A basket at the top of the stairs holds her favorite throw blankets, a hint at the master suite beyond. Patterned fabric winds around the windows. “When you close the drapes, sort of let them fall, the light hits through them. 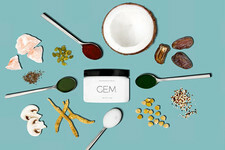 It’s super magical.” Glass and brass bottles and beauty items add to the glamorous glow. But if her home’s vibe is casual and free-spirited, that aesthetic is as much personality-driven as it is born from necessity: in the designer’s words, her two kids and two dogs are constantly “climbing over everything.” By keeping things loose—see the scarf-like window treatments in the bedroom—she doesn’t worry about whether or not a fabric will get scratched up by any of the little ones. The house represents the Californian ideal of a nonconformist lifestyle that is at once easygoing but also polished, combining rock-and-roll edge with a dose of rumpled corners for everyday living. In this respect, she firmly practices what she preaches, stressing the importance of adjusting for your circumstances rather than fulfilling a particular look or style. To that point, the Karras living room is anything but formal. Seating options vary from floor pillows and a more traditional sofa to comfortable lounge chairs and small poufs scattered throughout. “You want people to be able to have a casual seat, you want people to be able to lie down and read a book,” Karras says. The dining room breaks the rules as well, in that it can function as both a high-class setting for a fancy meal or a low-key place for doing homework. 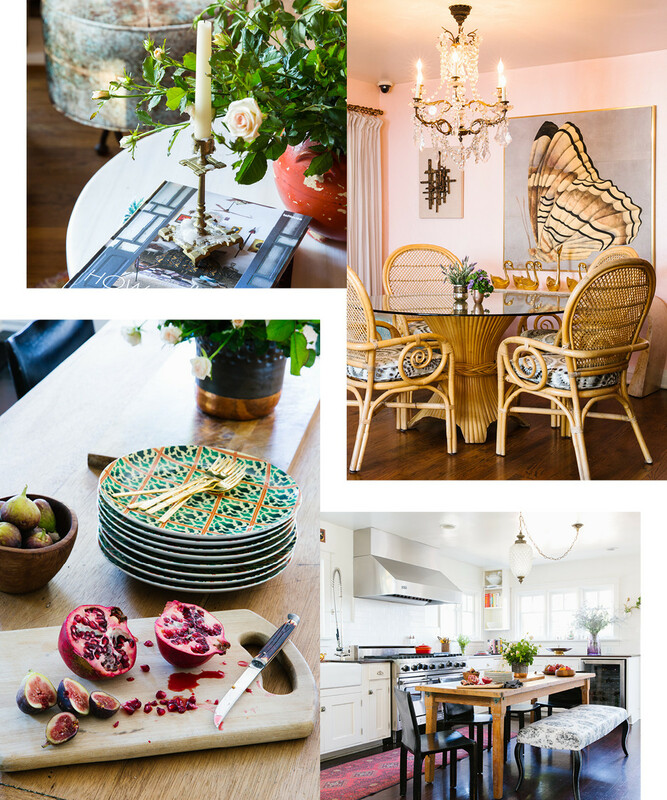 “I don’t really believe in traditional dining rooms,” she says. 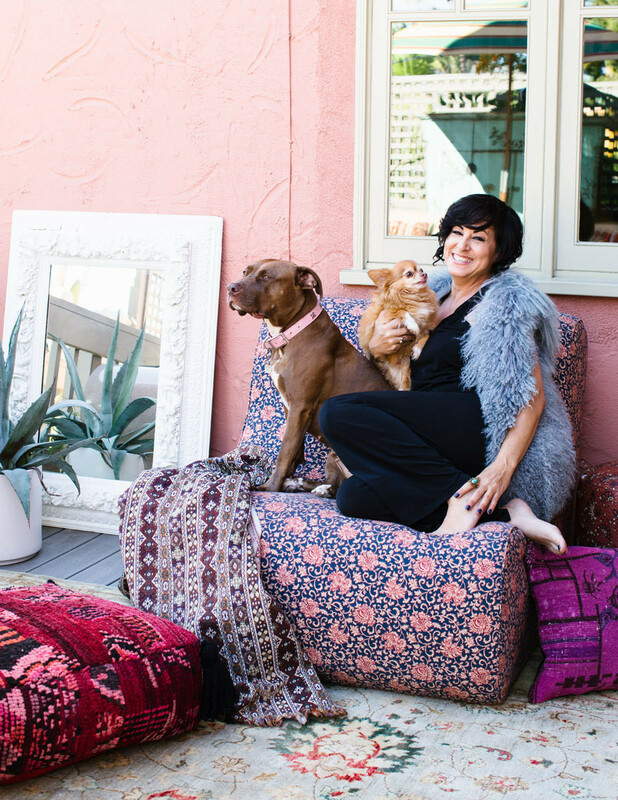 “They can get stuffy, and I don’t think people really use them anymore.” On the patio, Karras has channeled her penchant for the unexpected and created an outdoor living room with an assortment of reupholstered furniture that’s both glam and durable. Some of the areas Karras felt most strongly about decorating thoughtfully, however, tend to be the ones that are most frequently overlooked. 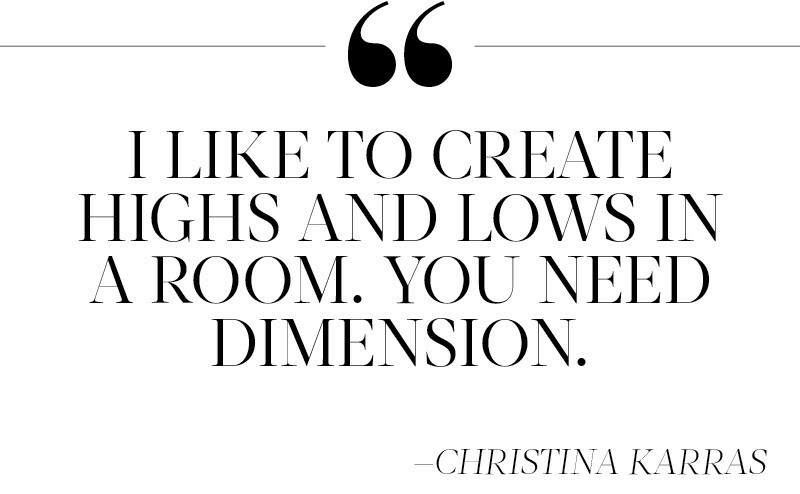 “If you’ve ever been to a party, and the staircase or hallway is done well, that’s where people hang out,” she says. To Karras, these spaces “are like bridges,” with residents constantly passing through on their way from one area to the next. 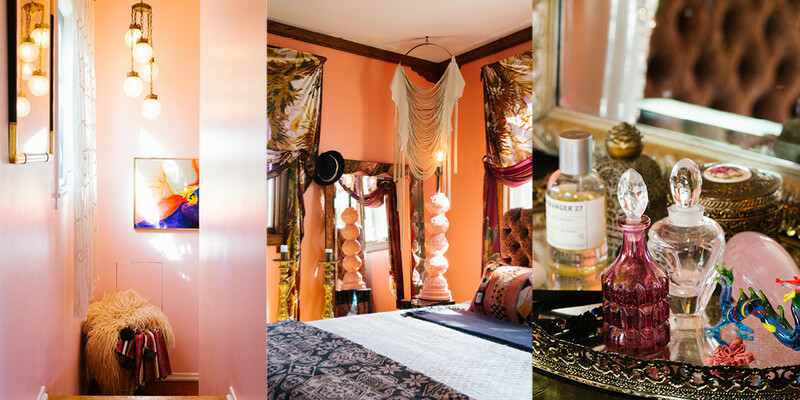 So she adds artwork and interesting lighting, patterned drapery and mirrors to make the hallways in her house feel as considered as the rest of her home. Albeit casually so. 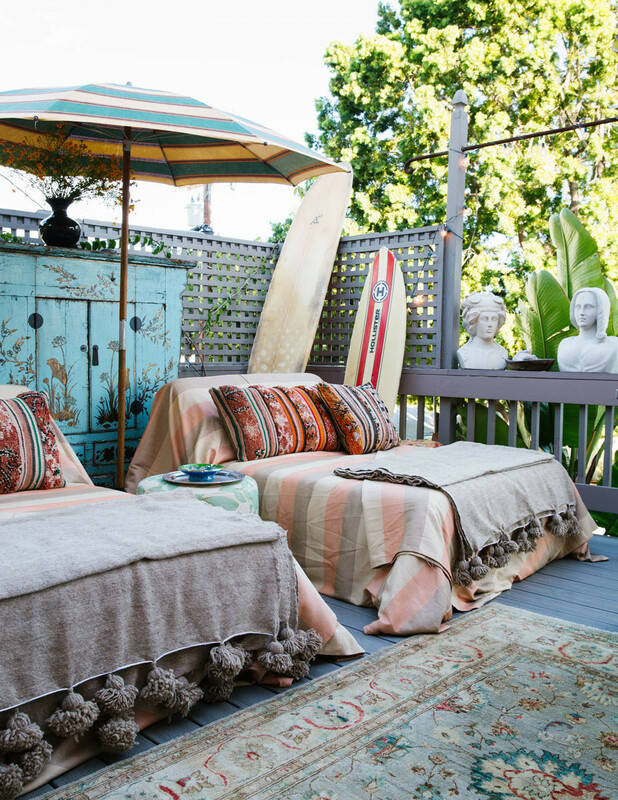 Two outdoor chaises are draped for lounging under a vintage striped beach umbrella. 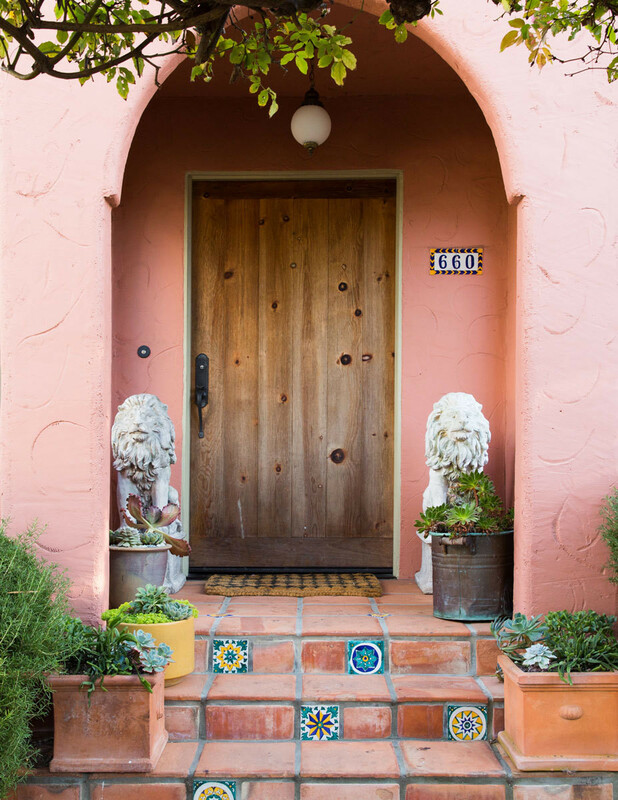 Original handpainted terracotta tiles accent the home’s welcoming covered entryway. “You can definitely tell that it’s an artist’s house,” says Karras. Designer James Huniford transforms a 1910 farmhouse into a contemporary home that's at once intimate and inviting. Designer Hannah Crowell creates a sophisticated house for a Finnish professional athlete with an artistic bent. 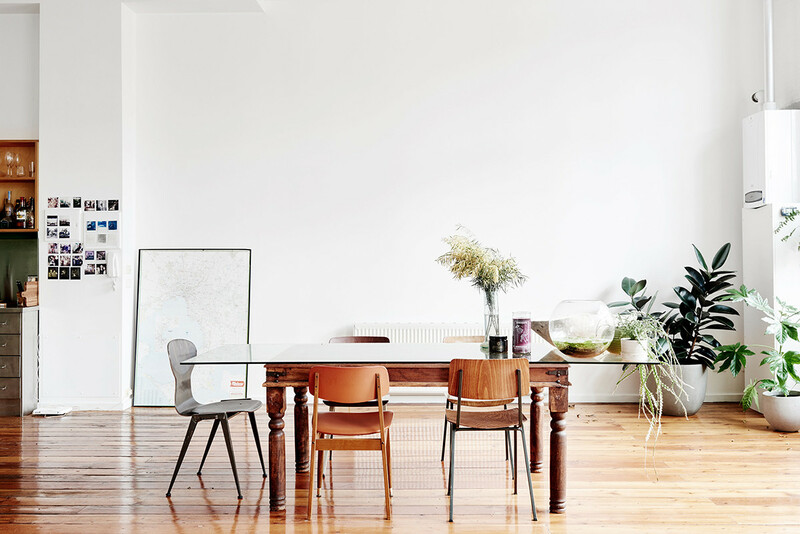 A pair of Aussie creatives apply a cool, collected aesthetic to their laid-back rental in Melbourne. 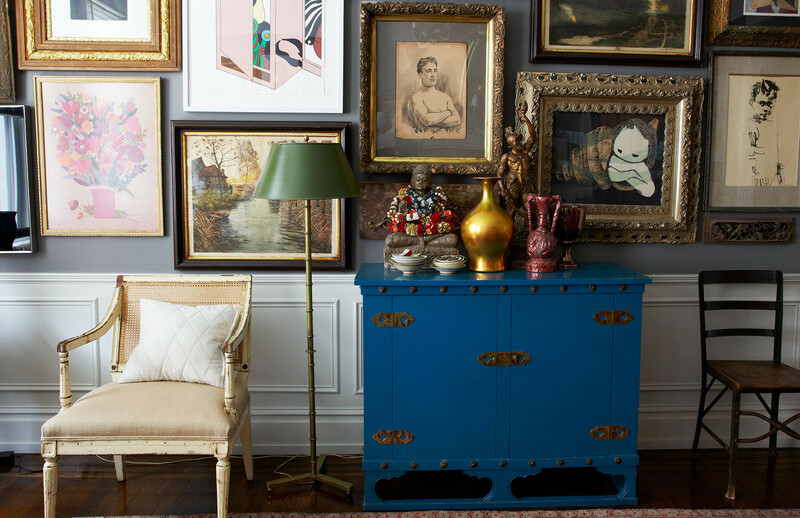 The celebrated ceramists fill their Jackson Heights, Queens, residence with secondhand treasures given new life.